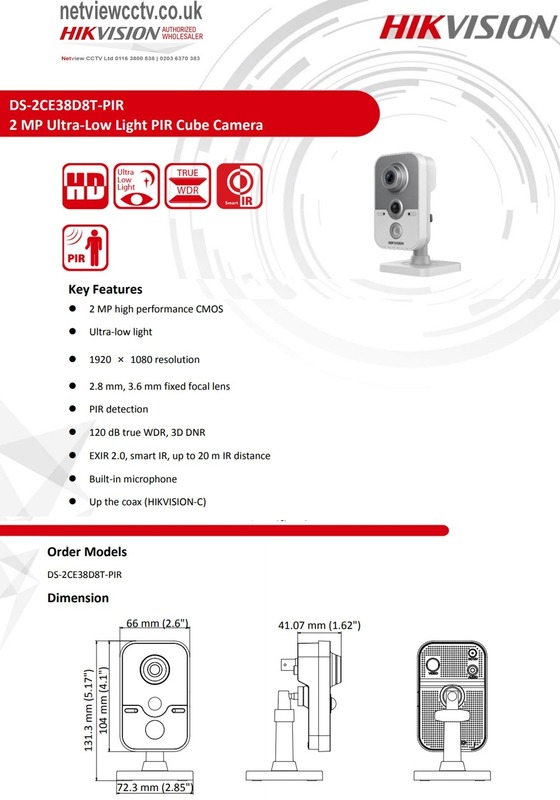 Part of the new Turbo v4.0 range the Hikvision DS-2CE38D8T-PIR is 2MP camera with high performance CMOS sensor and features analog HD output, up to 1080P resolution. The cameras are also equipped with ultra low-light technology, so they can produce clear, high quality images even in low-light scenarios – down to 0.005 lux. The sensor can filter out false alarms by differentiating between the infrared emissions of a human being from the other ‘noise’. So, when an inanimate object moves, there’s no alarm, but when it senses human body movement, an alarm is triggered. Filtering out false alarms saves on storage space and also means more efficient searching post-event, as there are fewer alarms to look through. We Recommend using a Hiwatch or Hikvision DVR with this Turbo HD Camera.